Take the cardboard tray from inside a discarded matchbox. Wrap an electric wire a few times around the cardboard tray. Place a small compass needle inside it. Now connect the free ends of this wire to an electric cell through a switch. Note the direction in which the compass needle is pointing. Bring a bar magnet near the compass needle. Observe what happens. Now, while watching the compass needle carefully, move the switch to the ‘ON’ position. Does the compass needle deflect? Move the switch back to the ‘OFF’ position. Does the compass needle come back to its initial position? Repeat the experiment a few times. What does this experiment indicate? We know that the needle of a compass is a tiny magnet, which points in north-south direction. When we bring a magnet close to it, the needle gets deflected. We have also seen that compass needle gets deflected when the current flows in a nearby wire. Can you connect the two observations? When the current flows through a wire, does the wire behave like a magnet? 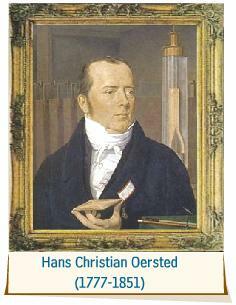 This is what a scientist called Hans Christian Oersted also wondered. 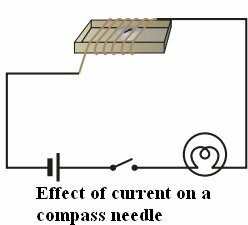 He was the first person who noticed the deflection of compass needle every time the current was passed through the wire. So, when electric current passes through a wire, it behaves like a magnet. This is the magnetic effect of the electric current. 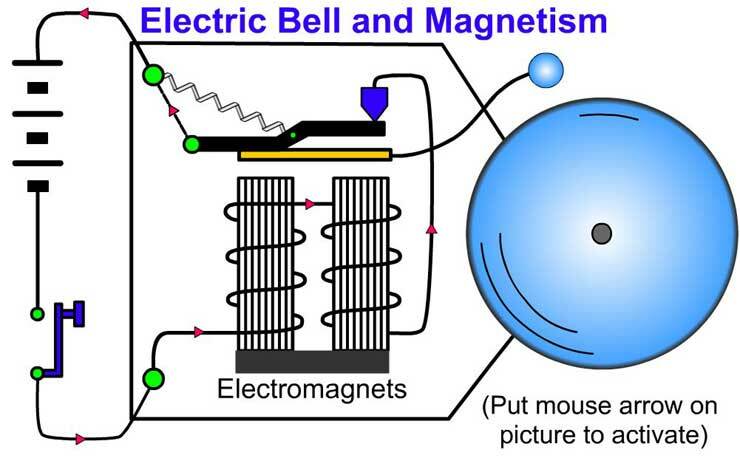 In fact, an electric current can be used to make magnets. Do you find it too surprising? Let us try it out. Take around 75 cm long piece of insulated (plastic or cloth covered or enamelled) flexible wire and an iron nail, say about 6–10 cm long. Wind the wire tightly around the nail in the form of a coil. Connect the free ends of the wire to the terminals of a cell through a switch. Place some pins on or near the end of the nail. Now switch on the current. What happens? Do the pins cling to the tip of the nail? Switch off the current. Are the pins still clinging to the end of the nail? The coil in the above activity behaves like a magnet when electric current flows through it. When the electric current is switched off, the coil generally loses its magnetism. Such coils are called electromagnets. The electromagnets can be made very strong and can lift very heavy loads. The end of such a crane has a strong electromagnet attached to it. 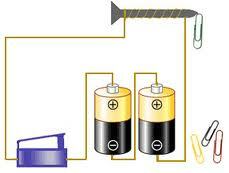 The electromagnets are also used to separate magnetic material from the junk. Doctors use tiny electromagnets to take out small pieces of magnetic material that have accidentally fallen in the eye. Many toys also have electromagnets inside them. We are quite familiar with an electric bell. It has an electromagnet in it. Let us see how it works. The diagram shows the circuit of an electric bell. It consists of a coil of wire wound on an iron piece. The coil acts as an electromagnet. An iron strip with a hammer at one end is kept close to the electromagnet. There is a contact screw near the iron strip. When the iron strip is in contact with the screw, the current flows through the coil which becomes an electromagnet. It then, pulls the iron strip. In the process, the hammer at the end of the strip strikes the gong of the bell to produce a sound. However, when the electromagnet pulls the iron strip, it also breaks the circuit. The current through the coil stops flowing. Will the coil remain an electromagnet? The coil is no longer an electromagnet. It no longer attracts the iron strip. The iron strip comes back to its original position and touches the contact screw again. This completes the circuit. The current flows in the coil and the hammer strikes the gong again. This process is repeated in quick succession. The hammer strikes the gong every time the circuit is completed. This is how the bell rings. Hans Christian Oersted was the first person who noticed the deflection of compass needle every time the current was passed through the wire. When an electric current flows through a wire, it behaves like a magnet.  A current carrying coil of an insulated wire wrapped around a piece of iron is called an electromagnet. The electromagnets are also used to separate magnetic material from the junk.